ATLANTA, July 11, 2016 – Hospitality Upgrade Publisher and President Rich Siegel announced the creation of the John Cahill Honorary Seat, a very special addition to the annual CIO Summit. Beginning this year and each year following, one student will be awarded an exclusive invitation to attend the CIO Summit in Mr. Cahill’s honor. 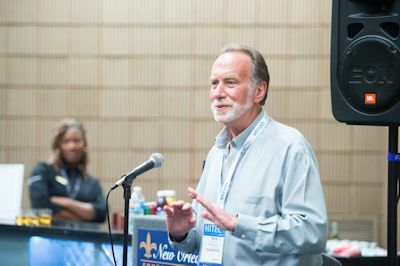 Hospitality Upgrade first announced this special addition at the John Cahill Memorial Reception at HITEC 2016 in New Orleans. The John Cahill Honorary Seat will be awarded to one distinguished student from a selected university or four-year college with a hotel program. This student will be recommended by his or her professors as an individual with great potential in the hotel technology industry. The John Cahill Honorary Seat includes accommodation, attendance at conference sessions and evening events, and all conference meals and activities during the event. However, the real invitation is the selected student will be given an exclusive opportunity to network and learn beside some of our industry’s best and brightest technology leaders. Additionally, all conference events and meals have assigned seating, ensuring the student is immersed among the top technologists as networking is priority No. 1 at the Summit. John Cahill was a hotel technology professional, industry leader, mentor, father and friend. Over the course of his career, Cahill was the CIO for three hotel companies – ITT Sheraton, InterContinental Hotels and The Denihan Hospitality Group. Cahill’s list of industry contributions is extensive, including co-editing the inaugural CHTP exam in 1995. Cahill was inducted into the HFTP International Hospitality Technology Hall of Fame in 1993, and was an HFTP Global Past President (2001-2002). Above all, Cahill was a mentor. Hospitality Upgrade’s Rich Siegel wished to see his memory live on by presenting one student each year with an exclusive opportunity to attend an otherwise closed-door, invitation-only CIO Summit, allowing the student to sit in John’s seat for the two-day event. It’s something we know John would have loved. Hospitality Upgrade produces the annual CIO Summit – a unique, invitation-only event for chief information officers from hotel brands, management companies, cruise lines, gaming and independent hotels. This year’s CIO Summit will be hosted in Philadelphia on Sept. 7-9, 2016. For more information about The CIO Summit, please visit www.hospitalityupgrade.com/CIOSummit. With more than 32,000 readers in 110 countries, Hospitality Upgrade is committed to shaping and defining the future of the hospitality technology industry. With such formidable industry events as The CIO Summit and The Executive Vendor Summit, its network of industry trend-setters and technology purchasers is unparalleled. For more information or to sign up for a FREE subscription and join our growing network of informed hospitality technologists, please visit www.hospitalityupgrade.com. Why Did I Go to NYC? Was it the Technology?